"Concealed handgun instructor Michael Cargill said he’s filled some time in the required 10-hour course with lighter material, such as videos of a bruiser chimpanzee that springs from car trunks at the touch of a button to thump people. With courses chopped to four to six hours as the law, like hundreds of others, took effect Sunday, “we can cut out the videos and stick to the meat of what people need to know,” said Cargill, owner of Central Texas Gun Works in Austin. The law is indicative of Texas’ response to the debate over guns after the Newtown school shootings late last year. As many states restricted access to firearms, Texas lawmakers mostly looked for ways to remove obstacles from licensed citizens carrying weapons. Some of the more controversial measures, such as allowing concealed guns on college campuses, didn’t get out of the Legislature. But several others passed, making it easier to get and keep a license to carry a hidden weapon." "While some instructors and advocates of tighter gun laws say shorter courses don’t make Texans any safer, the measures’ backers say the best antidote to a mass shooting is more well-trained, armed citizens. “Absolutely, we are a safer community if more law-abiding citizens carry a firearm in a respectful and appropriate manner,” said Rep. James White, R-Hillister. He sponsored the measure primarily, he said, because he believes in as few Second Amendment restrictions as possible. Paula Bond, co-owner of DFW Shooters, voiced concern over the change. Cargill says the faster class just makes sense. In a recent session, he labored to keep the attention of the dozen or so students that gathered in his fluorescent-lit classroom in a strip mall between a passport shop and a jewelry school. He burst with sound at unexpected moments. He acted, with fake sobbing and feigned anger. To induce a visceral reaction, he mimicked the noise of blood squirting on a floor by rhythmically flicking his fingernails against his palm. It’s all an effort to convey the dangers, principles and laws of toting a pistol. Cargill, an Army veteran, said he was spurred to become a concealed carry advocate and trainer after his grandmother was mugged and raped at a Fort Lauderdale bus stop about 20 years ago. Cargill said he hopes the shorter class will bring in more customers. He already dropped the course price by about 30 percent to reflect the coming change. And a quicker course could lure Texans away from getting their handgun license from another state with more lax rules, he said. One of Cargill’s students, George Lombardo, said the 10-hour affair didn’t bother him, as it gave him time “to soak in the information.” Lombardo said he was there for self-defense and to exercise his Second Amendment rights. But “it’s also about protecting yourself from the government,” he said. Mike Cox, a handgun instructor and owner of Driftwood CHL near Kyle, dropped the price of his course as well but said he wasn’t sure how the course would change or affect his bottom line. Cox doesn’t expect the new law to shorten classes substantially. The new four- to six-hour time range doesn’t include shooting range time, which varies with individual competency levels — expert shooters could breeze through while novices flounder." "Overall, Cox said, the new law, while not major, is a positive step toward less government regulation of a constitutional right. Critics of the new law counter that future concealed handgun carriers need all the coaching they can get. Mark Payne, owner of Elite Handgun Academy in Dallas, says the shrunken course will leave students less prepared to handle the responsibility. About a third of the students entering his 10-hour course have never touched a gun. Payne worries another law that nixes a mandatory renewal course in favor of online renewal will hurt business as well. He is considering a lower course price. John Woods of Texas Gun Sense, which advocates for tighter gun laws including universal background checks, says shortened classes and other changes are the wrong solution. In 2007, Woods attended Virginia Tech University. His former girlfriend, Maxine Turner, was killed in the Virginia Tech shooting. Woods is now a molecular biology Ph.D. candidate at the University of Texas. Effective Jan. 1, concealed handgun license applicants will no longer be required to furnish a Social Security number. That could allow dangerous individuals to slip through the screening process, Woods said. “If people are going to be carrying guns around in public, we need to make sure that they are trained and appropriately background checked and that they are not going to be a threat to anyone else,” he said. Ultimately, said Sen. Donna Campbell, the New Braunfels Republican who sponsored the course-shortening measure, the original 10-hour course time was set arbitrarily. Restrictive gun laws, she added, take firearms away from the “good guys,” not the criminals. “We have the right as citizens, across our nation, to carry,” Campbell said. “And I don’t want to make it difficult for law-abiding citizens to carry.”"
"...less government regulation of a constitutional right"..
"...best antidote to a mass shooting is more well-trained, armed citizens." "...as few Second Amendment restrictions as possible." "... faster class just makes sense. In a recent session, he labored to keep the attention of the dozen or so students that gathered in his fluorescent-lit classroom in a strip mall between a passport shop and a jewelry school." ..."he hopes the shorter class will bring in more customers. He already dropped the course price by about 30 percent to reflect the coming change. 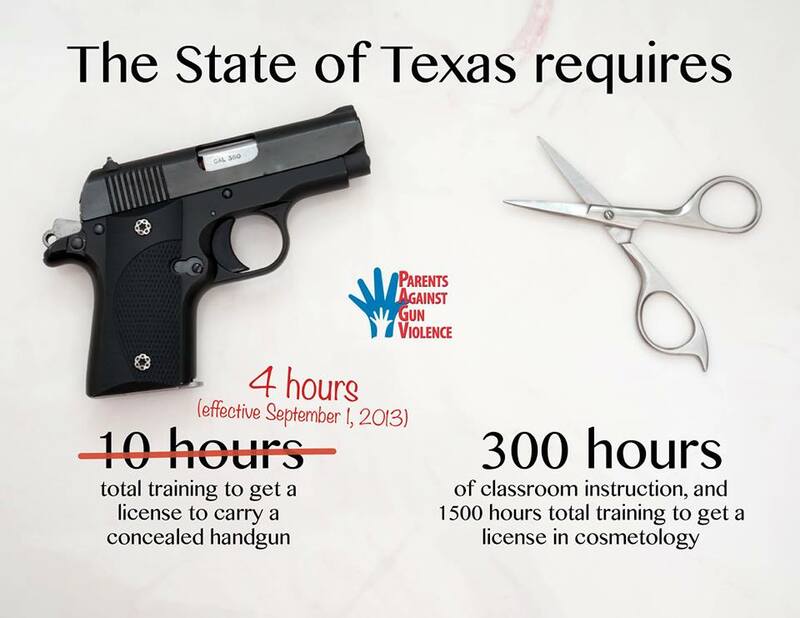 And a quicker course could lure Texans away from getting their handgun license from another state with more lax rules,..."
"...“it’s also about protecting yourself from the government,”..."
"... the original 10-hour course time was set arbitrarily." "...Restrictive gun laws, she added, take firearms away from the “good guys,” not the criminals." "...“We have the right as citizens, across our nation, to carry,” Campbell said. “And I don’t want to make it difficult for law-abiding citizens to carry.”"
Well. So that's it in a nutshell. This is not about public safety at all. This is about the corporate gun lobby's promoting business and the purchase of more guns. This is about people not being able to stay awake for a 10 hour class. This is about protecting yourself from the government. This is about what some people claim is an unrestricted right to do whatever they please with their guns. This is about making sure the "good guys" get their guns and permits. What nearby states have looser requirements for getting a permit to carry, by the way, just out of curiosity? Arizona requires no training. Oklahoma allows Open Carry but this article talks about New Mexico and Nevada requiring no permits to carry. And so this is really about "dumbing down" towards the least restrictive laws to carry guns instead of thinking about public safety. It's got to be more convenient not to sit through training or even get any training at all. And the number of gun deaths in these neighboring states? Texas=11/100,000. Arizona= 18/100,000. New Mexico= 16.6/100,000. Oklahoma=13.1/100,000. Nevada= 17.3/100,000. Louisiana=19.5/100,000. And then how about, say, California where laws are much more strict? Gun deaths=9.8/100,000. So far, Texas has fewer gun deaths than most other nearby states. So it makes perfect sense to emulate those states, right? And if this law passed in Texas, you can bet that the corporate gun lobby will be bringing it to a state near you. Is there any proof that putting people out onto the streets of Texas with less training will lead to a safer state? Texas will now allow people to take a class to carry a loaded gun around with them in public without providing a Social Security number which provides a less stringent background check. Good grief. I have to provide a Social Security number to open a credit card or any number of other things that don't involve life and death decisions. Training for just about anything people do as well as background checks these days, are more strict than for carrying a lethal weapon in public. Take a look at the graphic, above, provided by Parents Against Gun Violence. This is a really bad idea and makes no common sense. This is not about public safety. This is about the politics of people who think that requiring more training takes guns away from the "good guys". Of course it doesn't. This kind of rhetoric is fact free and should not be allowed to stand in our state legislatures. The very idea that Representative Donna Campbell says she doesn't want to make it difficult for law abiding citizens to carry is chilling. We should be making it more difficult, not less. "Law abiding" gun permit holders have shot people in public places. Take Jared Loughner for one. Take Andrew Engeldinger ( and here) for another. These are just a few of the more high profile shootings committed by "law abiding" gun permit holders. You can find many more on this report from the Violence Policy Center. Anfinson said the genesis of the law, which has been in place since at least 1981, was likely to protect permit holders from people who could look up their information and steal their firearms. But because the wording "all data" is so broad, Anfinson said it applies even to criminals who have had their permits revoked, or even to the deceased. There are some ways data on permit holders who have committed crimes can be made public: if it's revealed either in a court record, for example, or in a law enforcement investigation that's been made inactive. And then there's a provision in the Data Practices Act (Subd. 15) that allows any law enforcement agency to release any criminal investigative data classified as confidential if the agency deems that it would be in the "public interest" to do so. Which may explain why the Oakdale police chief at least hinted that Nhan Tran, who is accused of randomly shooting and killing 9-year-old Devin Aryal Monday night, had a permit to carry a gun (though he wouldn't outright say it). "We are comfortable that Tran was not in possession unlawfully," Chief Bill Sullivan said. Do you think it's in the public's interest to know if criminals have been issued a permit to purchase or carry? Update, 4:15 p.m.:To clarify, law enforcement can't report all of the gun permit information on criminals, even if they feel that doing so would be in the public's interest. The part of the law that allows law enforcement to disclose non-public information only applies to criminal investigative data, notes Toni Beitz, a senior assistant attorney with Hennepin County. So in other words, if police find out through a criminal investigation that a suspected criminal is a permit holder and they want to release that information, they can, Beitz said. However, if they find out that information after a conviction, then they cannot give that information to the public, no matter how much they feel it would be in the public's interest. A Roseville man’s belief that his wife was having an affair with her co-worker may have been the reason he shot and killed the man and then himself outside her workplace, authorities said Friday. Roseville police responded to a report of a shooting with two men down at 4:15 p.m. Thursday near the loading dock area of CPI Card Group, a plastic card printer located at 1975 W. County Road B2, a few blocks from the Rosedale Shopping Center. Police say Cheng Vang, 44, and his wife, Yong Vang, 37, both from Roseville, traveled to the business, where she works, to meet with her co-worker Joseph Yang, 33, of Brooklyn Park. Once there, Cheng Vang shot Yang multiple times with a semi-automatic pistol before turning the pistol on himself, police said. Yong Vang, who witnessed the shootings, went to the aid of her husband before police arrived. The details of the meeting are under investigation, but authorities said in a news release they believe it was prearranged. Yang had a pen and paper documents when he was killed. Near Cheng Vang’s body, investigators found the pistol, which police determined he purchased legally in May. Nearby surveillance cameras showed the Vangs arriving and parking on the east side of the loading docks with Yang arriving moments later and parking parallel to them. With the surveillance camera triggered to record only large object movements, the image stopped shortly after both Cheng Vang and Joseph Yang exited their vehicles and met. This shooting appears to be another domestic shooting and also a workplace shooting. We don't know if the shooter here was a permit holder but he sure as heck had the idea that it was perfectly OK for him to take his gun out in public and settle a difference with someone by shooting him. Is this what we want on our streets and in our communities? When bullets start flying in public, one never knows where they will end up. This was in a parking lot of a small shopping mall where other businesses and customers could be at risk. Or what about this one in Kansas where a man was "relieving his stress" while drinking and doing drugs, by shooting his gun outside of his back door. Why have a gun for self defense if you think you need it to relieve stress? There are plenty of potentially non lethal things one can do to relieve stress. Shooting off a gun is not one of them. But this is what we have now in our country when so many people who shouldn't have guns or permits get them anyway. This is the gun culture we need to address. Guns are dangerous. They should be treated with great respect and not carelessly or cavalierly used to take the life of another human being. Sure, most gun owners think they are law abiding and nothing will ever happen to them or someone they know or love. Until suddenly it does. My family knows that very well. It's time for us to have a serious discussion about the risks versus the benefits of guns. I am hoping that will happen in our legislatures and in Congress and with much better research and information that will come from the Centers for Disease Control and other places. We must have that debate with facts and evidence. Let's get to work. Lives depend on it. There are two good ways of seeing if a criminal had a carry permit when a crime is committed. The first is that you have but to see if he's charged with illegal possession or carry without a permit. The second way is that the Minnesota BCA publishes a yearly report which includes the numbers of permit holders that commit various crimes. Even ones that don't involve firearms are included, including traffic offenses. The release of personal information by the government has become a concern with the growing problem of identity theft. In fact, Minnesota has recently been in the news because it was discovered that many law enforcement personnel had misused the databases that are available only to authorized people. So, having strict rules in regards to data privacy protects a greater number of people. If those who are entrusted to secure this information are allowed free reign to release this information, then it really isn't private. Mark, I do know that. You may have missed my point. I think that when a crime is committed, the public has a right to know if that person was a permit holder. Most especially if it was a shooting. It makes a difference. I would have no problem with the information being released after conviction. It is legal to have gun in your car, boat, RV, home etc. without any permit. CHL permits are not needed for transport from/to places where you do not need a permit. So, if you park your car down the road, you do not need a permit between you home and your car. http://www.txdps.state.tx.us/rsd/chl/reports/convrates.htm has the crimes committed by CHL holders compared to the general population. TX CHL holders have a very low crime rate, practically zero. I didn't know about all of that, Texas. But we have gone over the last part of your statement before so no need to go over it again. I'm not aware of any study showing any sort of correlation and causation between the number of hours that a permit holder goes through and the rate of crime committed by permit holders. Defining the number of hours for training is not a good way to define a training requirement in any event. Minnesota has content in a required curriculum, which instructor certifying organizations then build into a curriculum and submit to the BCA for approval. That curriculum is then used in permit training. There is not a defined # of hours of training - instead there are required subjects that must be covered. There are several states that do not have a training requirement and have done so for decades yet continue to see crime drop overall - including gun violence only rates. japete writes: "This is not about public safety at all. This is about the corporate gun lobby's promoting business and the purchase of more guns"
I'm not sure how you draw that conclusion from the facts presented in these articles. "More lightly trained permit holders carrying guns where the rest of us hang out with our friends and families is likely to result in more serious problems, not fewer. The trajectory is moving in that direction." There is zero data to support that. What data are you using to support that conclusion? "They are supposed to be more law abiding than the rest of us because we are granting them permits to carry loaded guns around in public..."
Which the data in Minnesota, and other states, quite clearly shows. "It's time for us to have a serious discussion about the risks versus the benefits of guns." Great - where can we have that discussion? Publicly and without censorship? Isn't this what it's all about Bryan? We disagree about this stuff. But we don't have the best facts on either side. That is why we need more research to figure out what is the best path for public safety. In the end, this is about saving lives and being free from gun violence in our communities. So far that isn't working out too well. We've tried the CCW laws and that hasn't done it. Now we need to try requiring background checks on all gun sales to see how that works. Maybe we should try some other measures as well. But we haven't yet. We've tried what you guys want. Now it's our turn to try some things. If it doesn't affect your ability to own your guns, it won't affect you anyway. So why not? japete writes:" "Now it's our turn to try some things. If it doesn't affect your ability to own your guns, it won't affect you anyway. So why not?" The assault weapons ban and magazine ban that your organization testified in favor of earlier this year in Minnesota directly impacted my ability to own firearms and accessories. So yes, it affects me. "But we don't have the best facts on either side. " There are plenty of facts supporting my arguments. You just choose to ignore that data. "That is why we need more research to figure out what is the best path for public safety." I'm all for fact-based unbiased research - because I know that it ultimately supports my point of view. "Now we need to try requiring background checks on all gun sales to see how that works. " And why should we try this? The underlying data is nearly 20 years old and faulty at that. What current data do you have showing that these laws would have an impact - and would be enforceable? Common sense indicates that these sorts of laws are entirely unenforceable. "Maybe we should try some other measures as well. But we haven't yet. " Sure. Gun bans, restrictions on magazines, and other laws that impact the law abiding citizen. Minnesotans rejected these sorts of laws quite clearly in the past legislative session. This is not what people are asking for. Bryan, Bryan, Bryan- you just made my point. The research is old and we need more of it. I'm glad you agree about that. So you shouldn't object then to President Obama ordering more research in the area of gun violence. I am not sure why you are so sure the research will support your point of view. I am not necessarily saying that. I just know the facts as they are now which show that we have too many gun deaths and that states that have more restrictive laws have fewer gun deaths and most other countries that have much more restrictive laws than ours have many fewer gun deaths. I just want fewer people to die and I am not convinced that having more guns has made us safer or has achieved that end goal. Minnesotans did no such thing as to reject the laws. They actually supported them in fairly large numbers. It was the NRA bought and paid for legislators who rejected the laws. From the article: " Survey respondents at the House booth also expressed overwhelming support for another measure that withered under intense scrutiny last year, with 82 percent saying they want mandatory background checks for private sales at gun shows; less than 15 percent opposed the idea. The support for background checks is consistent with the House’s 2010 State Fair poll, when 85 percent of respondents favored the proposal. House Public Safety Committee Chair and bill author Rep. Michael Paymar, DFL-St. Paul, was stifled in his effort to carry a gun control bill when a group of rural Democrats said they would not vote in favor of background checks. Paymar has pointed to public opinion poll support for background checks, and plans to revisit the issue next year." This is consistent with a U of M poll taken in 2006 that showed 82% of Minnesotans favoring stronger background checks. During the last legislative session, the Star Tribune polled people and came up with 75% in favor and similar numbers in a KSTP poll. To say that Minnesotans rejected the bills is an absolute lie. You mean the non-scientific self-selection poll that was hosted in a partisan setting? I wouldn't put any trust in those results. A real poll uses scientifically based methodology to ask unbiased questions to get to an answer. This poll was anything but that. japete writes: "To say that Minnesotans rejected the bills is an absolute lie." The legislature flatly rejected the gun control schemes proposed by Paymar and your organization. Even the one bill with strong bi-partisan support was kept from getting a hearing in the House or Senate - your organization opposed that bill as well, favoring a continued push for bans, delayed confiscation, and registration of firearms. Just because you don't like the results of polls doesn't mean they don't reflect what people want. All polling has shown support for background checks both in Minnesota and country wide. Even Republican pollster Frank Luntz found 75% of NRA members in favor of expanded background checks- twice- and that was before Sandy Hook. So you must be in the 25% of NRA members and gun owners, Minnesotans and Americans who don't favor common sense gun legislation that can save lives. Not many people would call bills to keep the wrong people from getting their hands on guns to be "gun control schemes." Have a nice day Bryan. 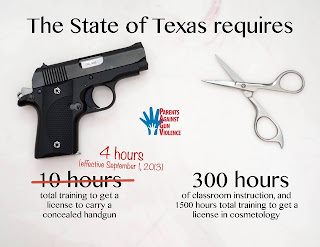 Your concern about reducing the number of hours required for Texas CHL training is much ado about nothing. When Texas passed the CHL law it was copied primarily from the laws other states had passed. The content of the course was mandated as were the number of hours training it took. Since the law passed it has become obvious that it did not take 10 hours to teach the mandated material. Many instructors added additional material to fill the time. This material ranged from sort of useful to actually detrimental. So the number of hours was reduced to what it would take to teach the required materials. There is nothing in the law that precludes the instructor from making the class longer. Will the populace really be in more danger if the chl holder doesn't get to see trunk monkey commercials? Now however instead of taking either two nights or a full Saturday to teach the course it can be done in one night making it easier for more people to fit the course into their schedule. As far as shooting instruction, the law provides for a shooting test, not instruction on shooting. Either you can demonstrate the ability to hit the target at various ranges or you can't. Every course I have seen advertised advises taking a shooting course before taking the CHL class if you do not feel confident in your ability to shoot. What the course does cover is the legal responsibilities of carrying a gun, when you can and cannot use deadly force, alternatives to use of deadly force, de-escalation, etc. Removal of the training course for a renewal of the permit was basically just removing a state mandated gift of $50 to $70 to the chl instructor. All it was was a refresher of what you had learned before. Did you happen to note that the people complaining about the shortening of the class and the lack of a class for renewal were the people who had money taken out of their pockets? They also had a feature that provided that if you shot a revolver at your test you could only carry a revolver from then on but if you qualified with a semi-auto you could carry anything. This was removed and I am sure you will be able to tell us how this will result in blood in the streets. These changes were not brought about by corporate interests but by lobbying for years by Texas gun owners and the Texas State Rifle Association. I rest my case, Robin. You must have missed the entire point of my post. I would venture to say that the Texas Rifle Association IS the corporate gun lobby. They represent the big money and huge influence of the NRA lobbyists in general and most likely ALEC as well.